It’s painful to watch Sen. Barack Obama slide over to the Right on so many important issues, as the presidential election heats up in ‘08. FISA, NAFTA and Israel are a few. He’s also met with Colin Powell and suggested that he might keep Robert Gates on as his Secretary of Defense. What’s next? Irv “Scooter” Libby as head of his Justice Department? If Obama doesn’t want to flop, like Sen. John Kerry did in ‘04, he better ponder changing his ways. 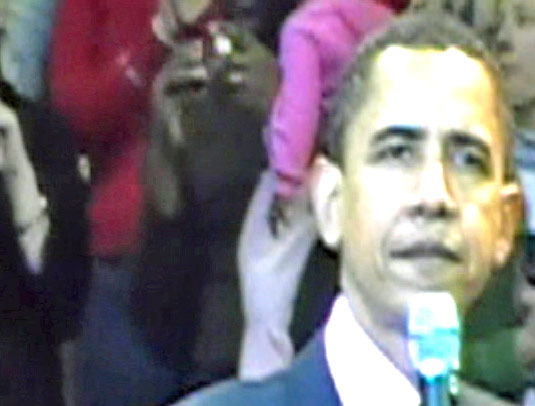 After Sen. Barack Obama, clinched the nomination to be the Democratic Party’s presidential candidate in the 2008 election, he began taking on bum advice. He is also running “scared” and it’s only July! No wonder the GOP’s standard bearer, Sen. John McCain, is smiling more these days. Sen. Obama, the supposed “Candidate of Change,” is fast reprising Sen. John Kerry’s losing, timid, don’t-rock-the boat strategy of his 2004 White House race against Dubya. As I write, Sen. Obama, who inspired millions in the primaries, is caving in on issue after issue. This is the same candidate who gave the appearance of strong resolve in smashing the Democratic Party’s Political Machine in Maryland last February. (1) Today, he’s looking like he’s part of that Old Boys’ network. Sen. Obama missed, in Zanesville, Ohio, an opportunity to champion the Separation of Church and State Clause. And, to also tell the folks of the great heartland, that they come first with him; and that he will see to it that the levees on the Mississippi, Cedar and Missouri Rivers are fixed; and that he will also place “Big Oil” under strict regulations. Sen. Obama should have also told them that NAFTA has to go and that “Fair Trade” is his objective. (3) And, that the “Enroning of America” under the Bush-Cheney Gang will, finally, be over when he is elected. Restoring the failing roads, bridges and highways of the nation will be on his agenda, too, and that the era of wasting billions of dollars in foreign aid to countries who are subjugating another people, will end after he is in the White House. And that he, Sen. Obama, will see to it that a Single Payer Health Care system--health care for all--is adopted in our America, in 2009. Sadly, he did none of the above. After Gen. Wesley K. Clark stuck a pin in Sen. McCain’s claim that his war record “qualified” him to be president, Sen. Obama left Gen. Clark hanging out there to dry. There are published reports, too, that Sen. Obama has recently met privately with Colin Powell. Yes, I said Colin Powell! Who will ever forget his disgraceful performance, on Feb. 5, 2003, before the UN’s Security Council, leading up to the illegal and immoral Iraq War? (4) Candidate Obama has also suggested that he might want to keep Robert Gates on as his Secretary of Defense. What will he do next to shock the hearts of his true believers? Propose Irv “Scooter” Libby as the head of his Justice Department? Let’s put it this way: Suppose JFK when he was running, in 1960, was pressured by the Wire Pullers to abandon his RC parish priest for whatever reason. Would Roman Catholics ever have looked at JFK in the same way? Sen. Obama should have taken the heat from the Rev. Wright critics--like that insufferable ranter, Richard Cohen of the Washington Post--and stood by Rev. Wright. (5) If he would have done that, he would have affirmed that he wouldn’t be baited by-guilt-by association smears. More importantly, Sen. Obama would have acknowledged the seminal importance to himself of the church-fiery-pastor-based tradition, that has nourished him, and many others; and, that has also, historically, been a solid pillar of strength for Black America through its most troubling of times. Just the other day, a pundit suggested that if the Democratic Party were to take a “strong anti-war position” in its Party platform, it could be “politically fatal” for its chances to capture the White House. (6) The author raised the specter of a repeat of the resounding defeat of Democrat Sen. George S. McGovern in the 1972 presidential election. I think the analysis is badly flawed. The 1972 race and the 2008 are as different as night and day. Richard Nixon, the incumbent in 1972, was popular with a majority of the electorate. While Sen. McCain will have to carry on his shoulders all of Dubya’s abysmal failures, including the current badly damaged economy. (4) Ira Chernus wrote the piece to which I am referring. What I found most interesting is this: He never mentioned once the U.S. casualties in Iraq, now 4,113 dead, with over 30,000 seriously wounded. Nor did Mr. Chernus say a word about the cost of the conflict to the American taxpayers--now estimated at a staggering $3 trillion. It is long past the time for a presidential candidate to surface who will say this: “I will not, under the guise of ‘supporting the troops,’ give a blank check to the Military-Industrial Complex, (MIC), a one-trillion-dollar-a-year drain on our national treasury.” President Dwight D. Eisenhower warned about the MIC, in 1954. (7) It’s time for that juggernaut to regear for a Peace economy and abandon the Bush-Cheney Gang’s War-Without-End game plan. Is Sen. Obama up to taking that kind of “special interest” on? 6. “Heed Lessons of ‘72,” by Ira Chernus, Baltimore Sun, July 2, 2008.